Kentucky fans rioting after the wins at the Final Four is nothing new – the joy of victory, agony of defeat, mixed in with some alcohol and some national pride or local patriotism can always led to unfortunate results. At best, it’s some rioting and property damage. At worst, it can result in hundreds of injuries and deaths, with the responses to the events so radical, they can change a sport completely, at least for a few years. As we’ve learned, history usually repeats itself, with those seeking out to destroy finding new ways to bring harm and damage upon others under the guise of being fans and personal or national slight. Politics, and a nation in turmoil are breeding grounds for more than just political unrest. These things seep into sports as well, with the state and mood of a nation and its inner conflicts are projected through the clashes on the pitch and in the stands. On February 1, 2012, 79 people were killed in Port Said, Egypt, after a match between Al-Masry and Al-Ahly. 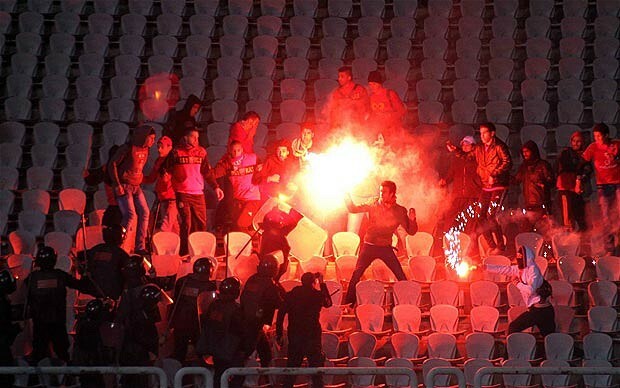 Thousands of Al-Masry fans invaded the pitch several times, eventually going after Al-Ahly players and fans, attacking them with knives, swords, clubs, stones, bottles and fireworks. More than a 1000 injured in the aftermath, as the police failed (or didn’t try to) to interfere. More than just crazy fans running wild, this was probably an organized attack by hired men. When football fans feel like they’re getting ripped off, this is what happens. The final of the Scottish Cup between blood rivals Rangers and Celtic ended in a 2-2 draw, ordering a replay a week later. That replay ended at 1-1, with the fans thinking it meant going into extra time. Rumors of the results being manipulated in order to create more ticket revenue, the fans stormed the pitch and destroyed everything in its path, with over a 100 people injured. No replay was played, as the title was withheld that year. Argentina and Peru played in Lima for the final ticket into the 1964 Tokyo Olympics. Argentina were 1-0 up, and with two minutes remaining, Peru scored a goal that wasn’t allowed. Crowd violence ensued, as the police locked up fans in the north stand and didn’t permit them leaving the stadium, while firing tear gas at them. Over 300 fans were killed, mostly due to asphyxia. In 1993, after the Montreal Canadiens won their 24th Stanley Cup, fans started committing acts of vandalism and violence in downtown Montreal. Stores looted and police cars were burnt, resulting in 170 injuries, 49 of them to policemen. In 1994, after the Vancouver Canucks lost in game 7 to the New York Rangers, tens of thousands concentrated in downtown Vancouver. It wasn’t clear how everything began, but in the aftermath, over 200 people were injured in the mayhem while one person was critically injured after getting shot with a plastic bullet to the head. 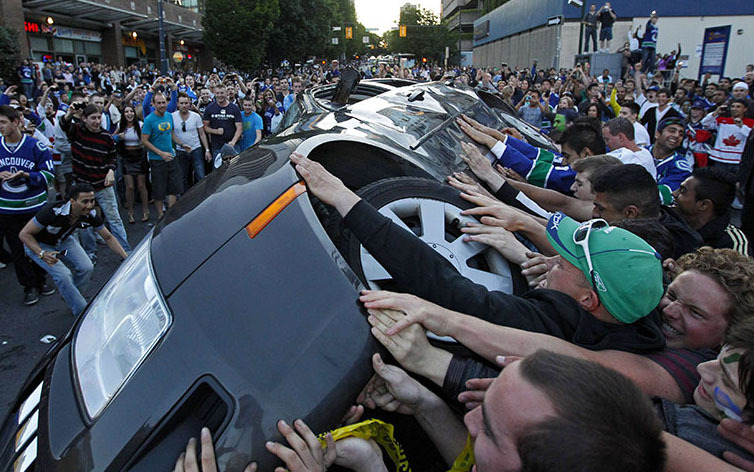 In 2011, the same scenario was repeated after Vancouver lost to the Bruins in Game 7 of the Stanley Cup. Not exactly riots, but more like surgical, planned, separated violence. The European Handball Championship was held in Serbia this January, with the host nation making it to the final before losing to Denmark. 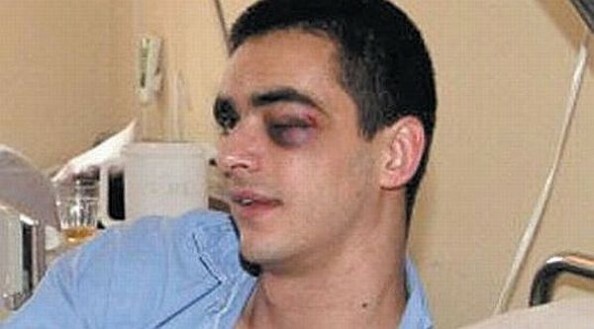 Serbia played against Croatia in the Semi Final, and Zarko Sesum was severely injured in his eye by a coin thrown at him. In previous days Serbian hooligans attacked Croatian fans in several spots around Northern Serbia, including setting a van on fire and stabbing a passenger with a knife. During the Sicilian derby in 2007 between Catania and Parma, clashes between Police forces and Ultras inside the stadium, mostly through tear gas firing, which resulted in the referee halting play for over 40 minutes because of the gas drifting onto the pitch, led to more severe incidents outside. Catania fans attacked the police after losing 2-1, killing policeman Filippo Raciti. A brawl began on the pitch between players from the clubs of Socozaki and Nyuki System, located in East Congo. One of the players on the pitch was accused of using witchcraft, causing the mayhem to ensue. The spectators pelted policemen with stones after they tried to intervene, leading to the firing of tear gas into the stands, resulting in a stampede. Suffocation led to the death of 13 people, with dozens more left injured. 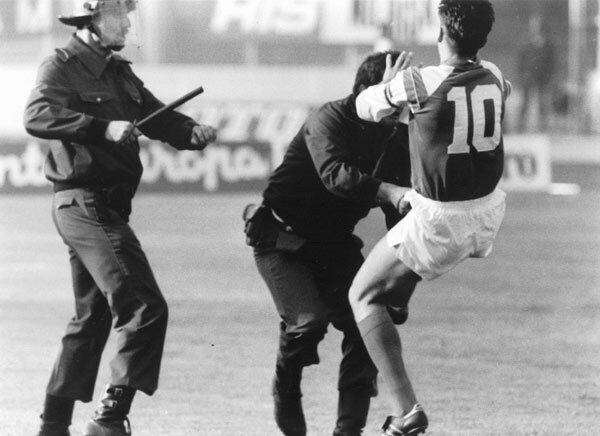 An incident mostly known for Zvonimir Boban kicking a police officer who was attacking a Dinamo Zagreb fan, leading to Boban being defended by the Bad Boys Blue, the Dinamo fans against the Police. 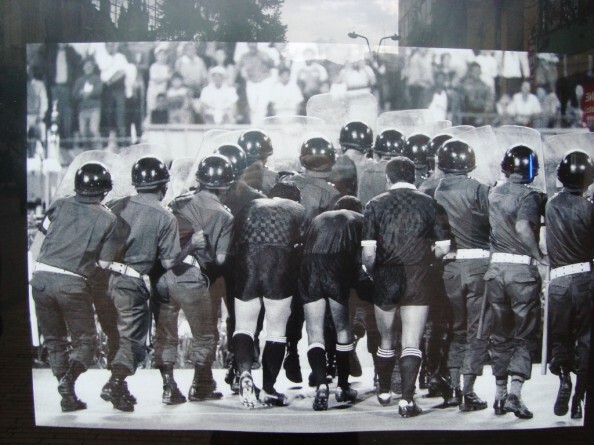 The political tensions in post-Communist Yugoslavia, about to be torn apart by war, led to clashes between fans of Dinamo and the visiting Red Star Belgrade, later resulting in the riots which the police couldn’t contain. An hour before the European Cup Final between Liverpool and Juventus, Liverpool fans broke down the fences seperating them from the neutral zone, which contained Juventus supporters. 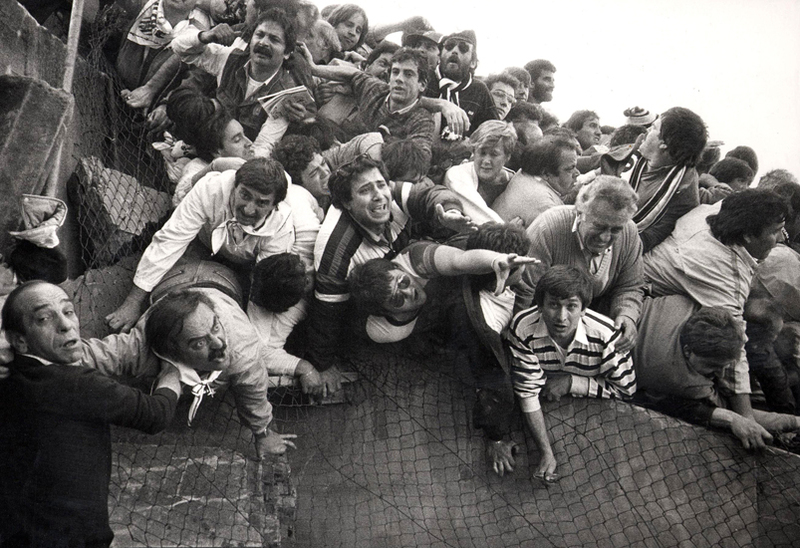 The Juve fans ran back from the attackers into a concrete wall, and while many were able to jump over, tragically, many fans seated near the wall were crushed, resulting in 39 deaths and over 600 injuries. English clubs were banned from European competitions for five years after the events, although it is unclear how many of the 20 fans charged with manslaughter actually served time. In 1967, during a match between Kayserispor and Sivasspor, 40 people were killed and over 300 were injured after clashes between the fans, throwing rocks and coming at each other with knives and bats led to a deadly stampede in front of the stand exits, with riots in both cities following.